Last night I got home from the hospital shortly after 5:30. I had battled rush hour traffic on the north side of town and pulled into my driveway with a few minutes of daylight remaining – just enough to walk my dog before it got dark. When I woke up in the morning the rain was falling and made every inch of yard, street and sidewalk a slushy mess. By the time I got home the falling temperatures had frozen almost all of that same territory completely over. Normally I love walking my 50-pound beagle/lab mix around the neighborhood when I wake up in the morning and when I get back from work. It provides me quiet time to collect my thoughts, gets me out of the house for some light exercise and gives me quality time with my pup. It also gives her the essential exercise and stimulation that she needs to be happy. There are times where she could certainly walk two or three hours non-stop just smelling all the smells on the ground. But yesterday was miserable. For both of us. Between the rain, the wind, the cold temperatures and complete lack of a good surface to walk on neither of us enjoyed our regular walk. And it’s been that way almost every day since the frigid temperatures set in. Luckily there are a ton of great resources at my disposal – more than a handful of veterinary specialists who had insightful advice on this very topic. I’m not a selfish person and didn’t want to keep all of that sound advice to myself so here I am sharing it with all of you. 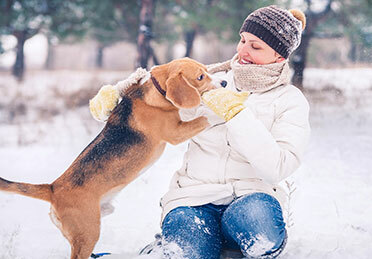 These are the best tips from the staff at CCVSEH to keeping your pet active during cold, dreary winter months. Keep Going Out for Walks. The elements create a challenge when it comes to taking our dogs for walks in the winter. Luckily there are ways to combat the elements. You can start by looking into booties to cover their paws. This will help protect them from painful deicers that can wedge themselves between toes. They’ll also help to hold in some warmth on particularly cold days. For dogs with short coats or single-layer coats you can add a layer with a dog-friendly sweater or jacket. You can also look into reflective leash covers to make you more visible to drivers since it gets dark earlier. Indoor Fetch. If you have a pup that love to play fetch out in the yard or the park, the games don’t have to stop because of the weather. A staircase is a great place to get a game of fetch going. You can start at the top and let the ball roll to the bottom or toss it up from the bottom to the landing at the top. Running up and down the stairs will provide a great workout for your dog. Go Shopping. Many pet stores allow you to bring your dog with you while you shop. So why not take your buddy with you on a trip for a new toy, a new treat or even a comfy new bed? He or she would love to sniff out their new favorite thing from the store whatever it may be. Play Hide-and-Seek. What dog doesn’t love treats? You can use these tasty morsels to get your pup off of the couch. Take some of his or her favorite treats and place them strategically throughout the house. Once they’re all hidden it’s time for “Fido” to hunt them down! It’s also a good chance to work on obedience and commands because you’re going to want the pup to stay put while you hide the treats. Learn New Commands. Dogs are eager to please their humans, that’s not a secret. They get satisfaction and mental stimulation when they work with you to learn new commands and tricks. Break out of the winter routine by spending some time learning new commands or tricks. If you don’t want to do it at home on your own you can also enroll in a local obedience class. Work For Their Supper. Dogs get most of their mental stimulation from the scents that they detect. A lot of them are also highly motivated by food. You can make mealtime a stimulating activity by hiding their food in an unusual location or by creating an obstacle course they have to navigate to reach their food. Underwater Treadmill. Our physical rehabilitation department has a state-of-the-art underwater treadmill that is a wonderful way for dogs to get exercise. The water is kept at a balmy 96 degrees, which will provide relief from the cold temps, and it allows them to bear 60 percent less weight thannormal because the water is filled to hip-level. The extra resistance provided by walking underwater helps to strengthen muscles and burn calories.